I can confidently say that, before reading Trevor Corson’s The Secret Life of Lobsters, the only thing I knew about this deep dweller was that it was delicious with butter. Like most ignorant seafood lovers, I had no idea what “lobster life” was all about, nor what has been done—and what continues to be done—by both lobstermen and scientists alike to ensure “our favorite crustacean” continues to satisfy our palates for eons to come. Just south of Mt. Desert Island and Acadia National Park sits Little Cranberry Island (how cute of a name is that! ), a tiny community with one major passion: lobsters. In an unlikely scenario, lobster fishermen and marine scientists are coming together to pool their knowledge about lobster fishing and breeding. With strict fishing rules and on-site studies being done by several lobster-loving scientists, the people of Little Cranberry Island are getting a much better grasp of life underwater and, more importantly, what can be done to protect this coast from over-fishing. Ironically a lot of the action in this book does not happen under the boat, but inside it. It takes a special person to dedicate so much time to fishing for lobsters, and Corson does a great job painting a picture of what one might expect while taking in the locals on Little Cranberry. In this sense, The Secret Life of Lobsters might remind one of The Discovery Channel’s series, Deadliest Catch. Each job has a player and all the players together put on quite a marine show. 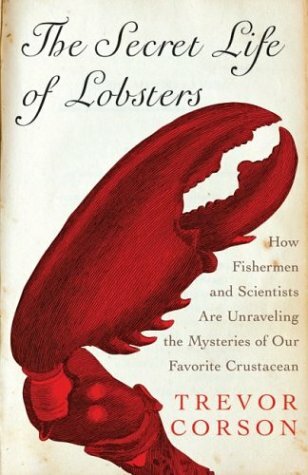 The Secret Life of Lobsters is the tell-all book for anyone interested in learning more about this fascinating industry. While you probably won’t want to hop a plane and spend a summer on a lobster boat, you might find yourself ordering a better meal next time you go out for seafood…or finding a new appreciation for those men and women behind the scenes who dedicate their lives to these deep sea dwellers. NEXT WEEK: For Pran Nath Kunzru, it takes more than a place to feel a sense of belonging…it takes a whole new identity.